Spasatel Demidov was built at Nevsky Shipyard in Shlisselburg. The vessel was designed by Marine Engineering Bureau. The fourth MPSV07 vessel is equipped to perform rescue and salvage operations. Image courtesy of Морспасслужба Росморречфлота. Spasatel Demidov was launched in August 2014. Image courtesy of Marine Engineering Bureau. The vessel will provide technical support and assistance to vessels in distress. Image courtesy of Морспасслужба Росморречфлота. Spasatel Demidov is a multi-purpose ice-class rescue and salvage vessel designed by Marine Engineering Bureau, for the Ministry of Transport of the Russian Federation. It is the fourth vessel in the series of multi-functional rescue-salvage ships being built under Project MPSV07. Spasatel Karev, Spasatel Kavdeykin and Spasatel Zaborschikov, the first three vessels of Project MPSV07, were launched in November 2010, July 2011 and June 2012, respectively and were delivered between 2012 and this year. Spasatel Demidov was built by Nevsky Shipyard on behalf of State Marine Emergency Salvage, Rescue and Pollution Prevention Coordination Service of the Russian Federation (SMPCSA) for the Federal Agency of Maritime and River Transport of the Russian Federation. 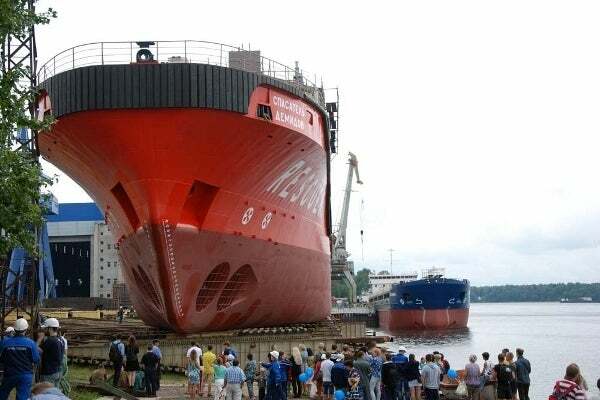 The keel for the vessel was laid in April 2013 and the launch was held in August this year during a ceremony held in Nevsky Shipyard in Shlisselburg. Academician Pashin is a replenishment oil tanker being built for the Russian Navy as part of Project 23130. Spasatel Demidov is approximately 73m long and has a moulded breadth of 16.6m. The vessel’s length between perpendiculars is 64.4m, operating draft is 5.1m and deadweight at maximum draft is approximately 1,171t. The vessel has a sea endurance of 20 days. The salvage vessel has been assigned the Russian Maritime Register of Shipping (RS) class notation KM8* Arc5  AUT1-ICS OMBO FF3WS DYNPOS-2 EPP Salvage ship. The MPSV07 ship is fully outfitted to perform worldwide operations including in the Northern Sea Route. The hull and propulsion systems ensure operations in extreme cold temperatures as low as -40°C. Spasatel Demidov will perform rescue and emergency salvage operations in navigation, fishing, and oil and gas marine recovery regions. The ship will provide support and assistance to vessels in distress and will search, rescue and evacuate people and provide them with medical assistance in emergency situations. "Spasatel Demidov will perform rescue and emergency salvage operations in navigation, fishing, and oil and gas marine recovery regions." The vessel, which will be capable of towing marooned, off-grounded or reef damaged ships, is outfitted with dewatering pumps to remove water from the flooded compartments of other ships. Two pumps of 405m³ per hour capacity and four pumps of 70m³ per hour capacity are installed aboard the ship. The ship features two special fire pumps with a capacity of 1,500m³/hr each and other fire-fighting equipment for extinguishing burning oils on the water-surface and fire on floating and coastal objects, and to clear oil spills including those with a flashpoint below 60°C. The ship is also equipped with machinery to investigate the sea bed and damaged objects lying in depths of up to 1,000m. The vessel will also carry out surveys and the cleaning of underwater-hull parts of vessels, and floating and coastal objects. MPSV07 can also perform underwater diving operations to depths as low as 300m. Spasatel Demidov has the capacity to accommodate 20 standard crew, 12 special staff and 69 survivors. Each crew member is accommodated in a one-bed cabin, with special block-cabins comprising of an office space, saloon, bedroom and bathroom provided for the captain, chief mate, chief engineer and head of the emergency party. The special personnel are provided with single cabins, each fitted with an additional folding bed and a six-bed hospital and two stand-by double-bed cabins also form part of the vessel. "Spasatel Demidov is fitted with a diesel-electric propulsion system including four WARTSILA 8L20 marine diesel engines with a capacity of 1,370kW each." Spasatel Demidov, which is capable of sailing at a speed of 15k, is fitted with a diesel-electric propulsion system including four WARTSILA 8L20 marine diesel engines with a capacity of 1,370kW each. The power plant is composed of three 300kW harbour generator sets, comprising of Deutz BF8M1015MС engines and Stamford HCM534E generators, as well as three 140kW emergency generator sets with Deutz BF6M1013FC engines and Stamford HCM434C generators. The propulsion system also features two HRP 7001TT bow-thrusters with an output of 995kW each and two Steerprop SP45D/L3600 rudder propellers with an output of 2,060kW each. Auxiliary equipment and systems include two thermal boilers with a power generation capacity of 1,000kW each and four 260kW systems for exhaust gas.